It was great to see many we have not seen for years! Thanks to all who joined in the fun. Pics have now been posted to the Reunion Memories page. Check out our Facebook page for a video of the official singing of Happy Birthday! If you're new to the site, you will need to register..but it's easy to do. Look to the top left corner of the page at "Classmate Profiles" and locate your name and click on it. Fill out the information you would like to share and then click save. Information on this site is PRIVATE and only available to other registered classmates. Make sure you save our site in your "favorites". We had a great time at our reunion - Missed those of you that were not able to attend. Photos from our 39th Reunion have been uploaded. Click HERE to view OR "Reunion Memories" link on the left. If you took any pictures from the weekend - please let me know so I can add them to the site. Look at these cuties! 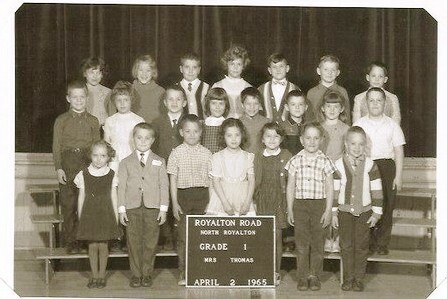 Many more elementary photos in the PHOTOS: K-8. We had a great time at the 35th reunion!! Photos from all past reunions can be found under the REUNION MEMORIES link. DO YOU HAVE ANY PHOTOS FROM PAST REUNIONS, SCHOOL YEARS, ETC YOU WOULD LIKE TO SHARE? IF SO, PLEASE CLICK THE "CONTACT US" LINK AND REQUEST INSTRUCTIONS ON HOW TO UPLOAD THEM. If you are interested in becoming a Life Member of the North Royalton Alumni Association, please go to www.northroyaltonsd.org. Click "Our District", then click "Alumni" and print the membership application. Fill out and mail $20 to North Royalton Alumni Association, 14713 Ridge Road, North Royalton, OH 44133. You may also email nralumni@yahoo.com for information. Thanks to our fellow classmates for their sponsorships! Click "Sponsors" link to check them out! If you would like to sponsor our website/next reunion, please contact administrator for details. Please note: This site is in no way affiliated with the alumniclass.com, classmates.com, alumni.net or mylife.com websites for the North Royalton High School Alumni. This is a free site that does not request a lifetime membership fee. Although you will receive occasional emails from this group, we will not be sending out any requesting you pay a monthly or yearly or even lifetime "membership" to join.